Inspired by the shoreline. The beautiful contemporary and intricate Isla design is inspired by shapes and textures found along the seashore. Featured on a comprehensive range of tableware shapes and beverage items, the modern yet graceful Isla embossment is reminiscent of the coastline. Hand applied accent colours in Ocean Blue and Shale Grey enhance the decorative embossment on feature items, catching light across the surface of each piece. • A comprehensive collection of 25 white embossed items. • A contemporary and intricate embossment, inspired by the shoreline. 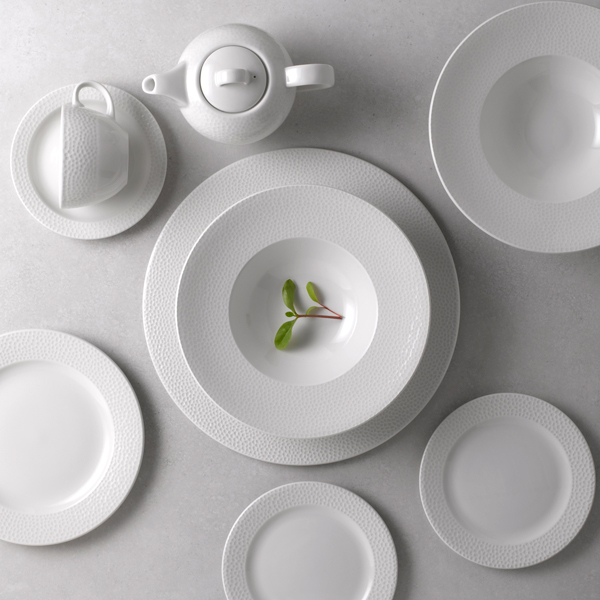 • 6 Statement tableware shapes available in two colours to accent the Isla range. • Items are lightweight, durable, designed to stack making them ideal for large scale banqueting events and restaurants. • Isla also offers a full beverage range, including a stainless steel tea infuser which fits the teapot. As featured in our brand new Be Inspired catalogue. For details of Ocean Blue plus beverage items please speak to one of the sales team for more information.